She has some great tips from unplugging your devices to getting enough sleep to getting out and taking a walk. Take care of yourselves, Flyers. WANT YOUR OWN STUDY ROOM DURING SUPER STUDY? ENTER OUR CONTEST! 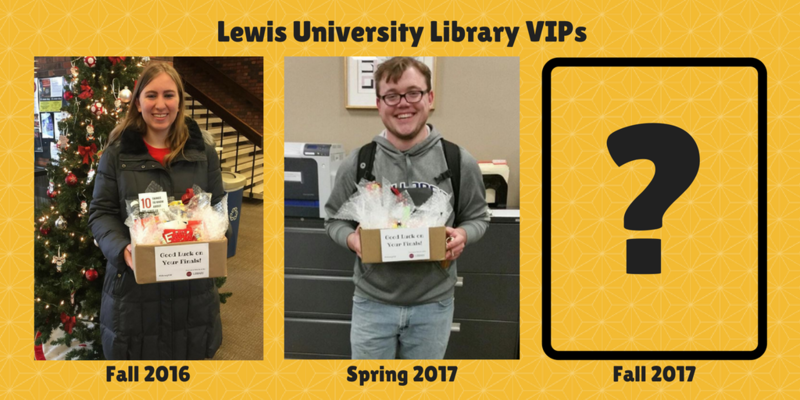 This semester during Super Study*, get the VIP treatment from the Lewis University Library: win your own study room on the day of your choice (plus a gift basket of swag, snacks, and study supplies). Do both to increase your chances of winning! We will randomly select one winner from all entries received by midnight on Saturday (11/17). The winner will be contacted via their Lewis University email, Twitter direct message, or Instagram mention on the morning of Monday, 11/19 and must respond by 11:00 p.m. that day. If they do not respond, a new winner will be selected. The winning student will have until midnight on Monday, 11/26 to select their preferred study room reservation date and time (any 12-hour period during library hours between Sunday, 12/2 and Friday, 12/14). Enter to win on Twitter and Instagram starting Sunday, 11/11: You might become the Lewis University Library VIP! *Super Study takes place during the last 2 weeks of each semester (for Fall 2018, that’s Sunday, 12/2 through Friday, 12/14) and includes extended service hours and expanded academic support for Lewis students. For more information, visit the CASE webpage. We will randomly select one winner from all entries received by midnight on Thursday (4/12). The winner will be contacted via their Lewis University email, Twitter direct message, or Instagram mention on the morning of Friday, 4/13 and must respond by 5:00 p.m. that day. If they do not respond, a new winner will be selected. The winning student will have until midnight on Monday, 4/16 to select their preferred study room reservation date and time (any 12-hour period during library hours between Sunday, 4/29 and Friday, 5/4). Enter to win on Twitter and Instagram starting Monday, 4/9: You might become the Lewis University Library VIP! *Super Study takes place during the last 2 weeks of each semester (for Spring 2018, that’s Sunday, 4/29 through Friday, 5/4) and includes extended service hours and expanded academic support for Lewis students. For more information, visit the CASE webpage. 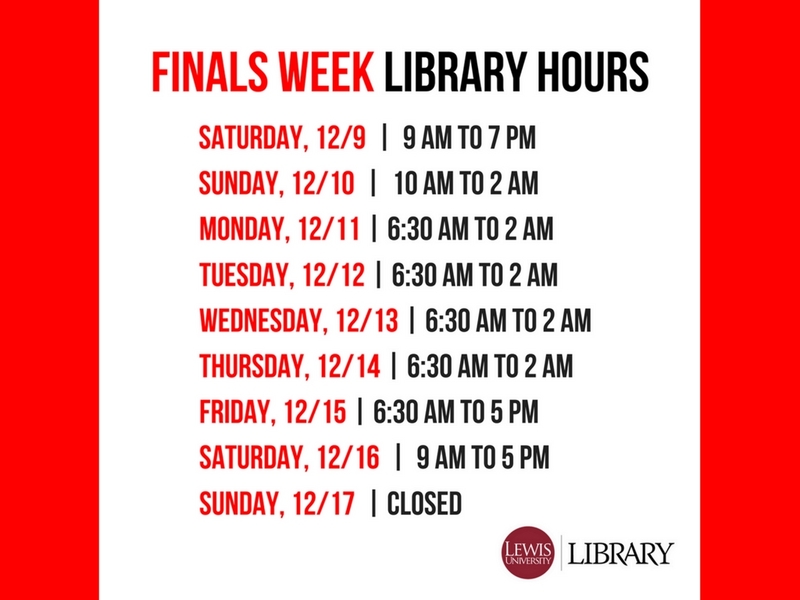 The Library will be open extra hours for your late-night study needs. In addition to study space, librarians will also be on hand to answer questions in person or via phone, text, chat or email. We’ll also have stress-relief activities in the Glass Conference Room and free coffee at hot chocolate in the vending area (while supplies last). 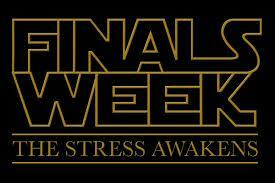 Good luck on your finals, Flyers! 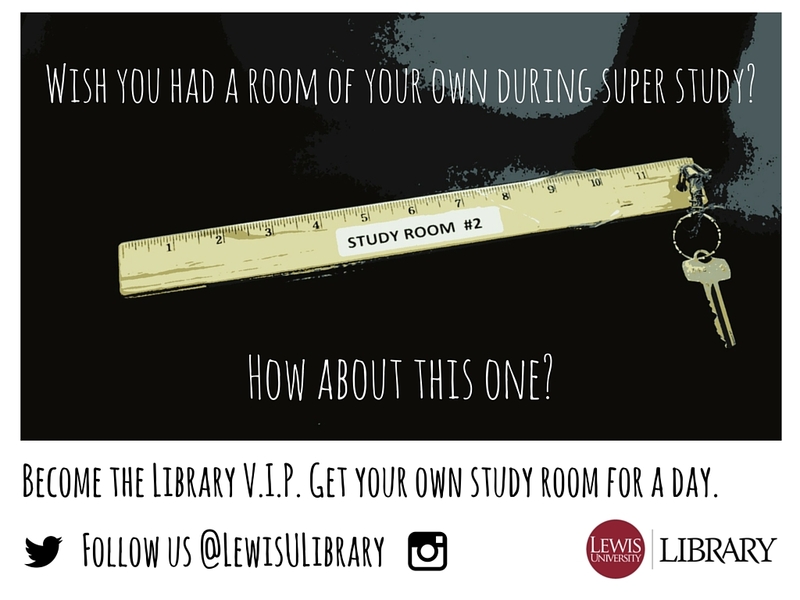 This semester during Super Study*, get the VIP treatment from the Lewis University Library: win your own study room on the day of your choice! We will randomly select one winner from all entries received by midnight on Thursday (11/16). The winner will be contacted via their Lewis University email, Twitter direct message, or Instagram mention on the morning of Friday, 11/17 and must respond by 5:00 p.m. that day. If they do not respond, a new winner will be selected. The winning student will have until midnight on Monday, 11/20 to select their preferred study room reservation date and time (any 12-hour period during library hours between Sunday, 12/3 and Friday, 12/15). Enter to win on Twitter and Instagram starting Monday, 11/13: You might become the Lewis University Library VIP! *Super Study takes place during the last 2 weeks of each semester (for Fall 2017, that’s Sunday, 12/3 through Friday, 12/15) and includes extended service hours and expanded academic support for Lewis students. For more information, visit the CASE webpage. Win Your Own Study Room during Super Study! We will randomly select one winner from all entries received by midnight on Wednesday (4/12). The winner will be contacted via their Lewis University email, Twitter direct message, or Instagram mention on the morning of Thursday, 4/13 and must respond by 5:00 p.m. that day. If they do not respond, a new winner will be selected. The winning student will have until midnight on Tuesday, 4/18 to select their preferred study room reservation date and time (any 12-hour period during library hours between Sunday, 4/30 and Friday, 5/12). Enter to win on Twitter and Instagram starting tomorrow: You might become the Lewis University Library VIP! **UPDATE: We have a winner! Congratulations to Anna Delegatto! We will randomly select one winner from all entries received by midnight on Thursday (11/17). The winner will be contacted via their Lewis University email, Twitter direct message, or Instagram mention on the morning of Friday, 11/18 and must respond by 5:00 p.m. that day. If they do not respond, a new winner will be selected. The winning student will have until midnight on Monday, 11/21 to select their preferred study room reservation date and time (any 12-hour period during library hours between Sunday, 12/4 and Friday, 12/16). Enter to win on Twitter and Instagram: You might become the Lewis University Library VIP! *Super Study takes place during the last 2 weeks of each semester (for Fall 2016, that’s Sunday, 12/4 through Friday, 12/16) and includes extended service hours and expanded academic support for Lewis students. For more information, visit the LARC website. What’s so super about Super Study? Let us count the ways. Extended hours. Starting Sunday, 4/24, we’re open 24 hours a day during the week, plus extra hours on the weekends. View the full schedule here. Research help from the Lewis librarians. Anytime the Library is open (including overnight), you can get help from a librarian in person or via email, phone, text, or online chat. You can find all of our contact information here. Individual and group study spaces. The Library offers a variety of study furniture options, from our whiteboard tables for collaborative work to our wall-facing study carrels for when you really need to minimize distractions. You can also go online and reserve one of our four group study rooms, or just drop in and see if one is available. Free coffee and hot chocolate anytime the Library is open (while supplies last, of course!). Drop-in stress-relief strategies sessions, from meditation to time management, offered throughout Super Study by the Center for Health & Counseling. Study break activities, including board games, jigsaw puzzles, coloring, and more. 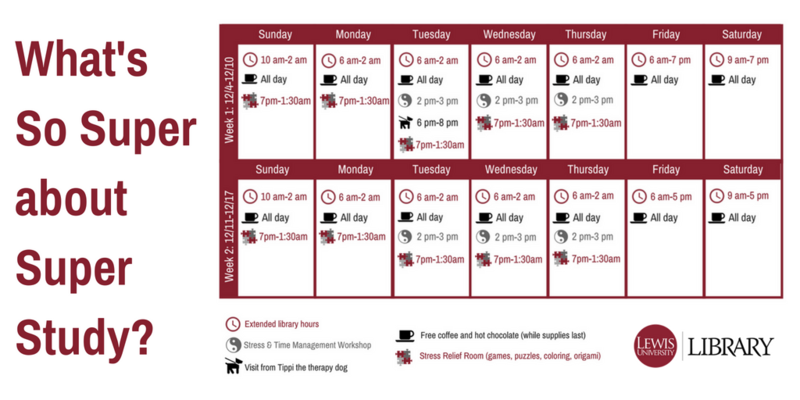 The Stress Relief Room will be open from 7 p.m. to 2 a.m. Sunday through Thursday of both weeks. A visit from Tippi the therapy dog. She’ll be in the Library from 6 to 8 p.m. on Tuesday, 5/3. Become the Library VIP–get your own study room for a day! We will randomly select one winner from all entries received by midnight on Thursday (4/7). The winner will be contacted via their Lewis University email, Twitter direct message, or Instagram mention on the morning of Friday, 4/8 and must respond by 5:00 p.m. that day. If they do not respond, a new winner will be selected. The winning student will have until midnight on Monday, 4/11 to select their preferred study room reservation date and time (any 12-hour period during library hours between Sunday, 4/24 and Friday, 5/6). Enter to win on Twitter and Instagram starting Monday, 4/4: You might become the Lewis University Library VIP! *Super Study takes place during the last 2 weeks of each semester (for Spring 2016, that’s Sunday, 4/24 through Friday, 5/6) and includes extended service hours and expanded academic support for Lewis students. For more information, visit the LARC webpage.